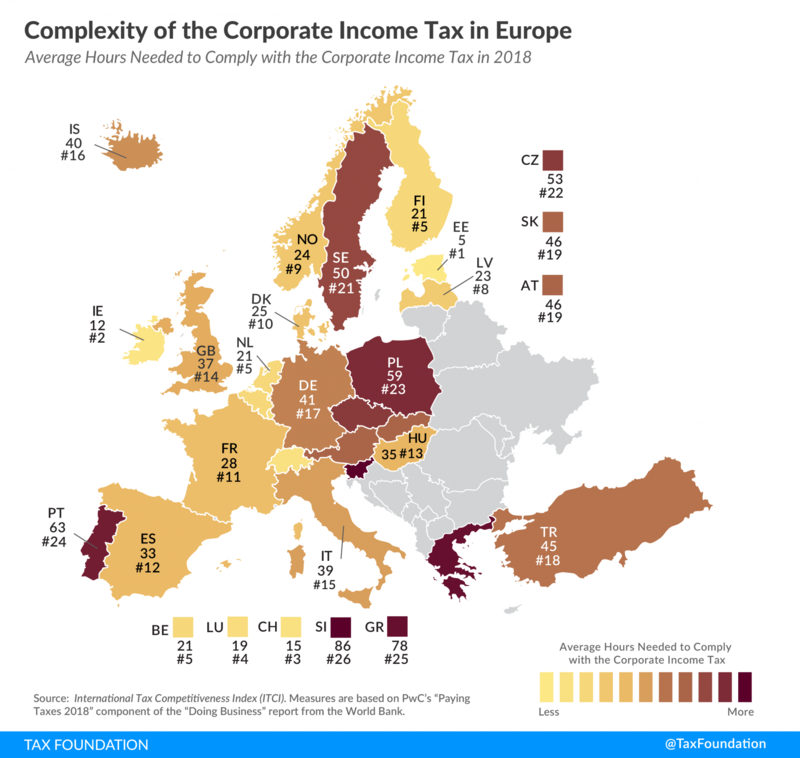 As today’s tax map shows, the complexity of corporate income taxes varies greatly across European countries. Corporate income tax (CIT) codes should be easy for corporations to comply with and for governments to administer and enforce. Simple, well-designed CIT systems can help encourage business activity, leading to increased investment and employment. In contrast, complex CIT codes can lead taxpayers to make inadvertent errors or enable tax avoidance. One way to quantify corporate tax code complexity is to measure the time needed to comply with the business tax. More precisely, the time to comply indicator reflects the number of hours (on average) it takes per year to prepare, file, and pay (or withhold) CIT, as measured by PwC’s “Paying Taxes 2018” component of the “Doing Business” report from the World Bank. Estonia, arguably the country with the most efficient tax system in the developed world, allows its taxpayers to file business taxes (as well as other taxes) electronically. Taxpayers only need to review a pre-filled form, make any necessary changes, and approve the document with a digital signature. As a result, Estonia’s CIT compliance takes the least amount of time in Europe, at five hours, followed by 12 hours in Ireland and 15 hours in Switzerland. Slovenia (86 hours), Greece (78 hours), and Portugal (63 hours) are the countries where taxpayers need the most time for CIT compliance. Apart from compliance time, the number of tax payments is also an informative measure for tax complexity. The tax payments indicator reflects the number of separate tax payments required for businesses to make throughout the year. This number can be influenced by separate payments for different taxes, such as CIT, sales tax, VAT, and labor taxes. This indicator also reveals how easier compliance can be put in place through electronic filing: Where a tax is paid and filed online by the majority of medium-size businesses, only one payment is included in the indicator (even where payments are made more frequently). Of all European countries covered, Norway’s businesses are subject to the lowest number of tax payments, with three. In contrast, Italy is the country with the highest number of required tax payments, with 13. Next week, we will continue our series on tax complexity by examining compliance time and payments associated with individual taxes in Europe.